When the Tour de France route is announced, as well as keenly looking to see which mountain passes are going to be included, I also like to see what the last stage will be. This year the route into the Champs Elysées was from Créteil, in Eastern Paris and I went along there with Higg. This route, though short was a spectator's dream. Créteil is at the end of Line 8 of the Paris Métro (Balard-Creteil Préfecture), so for us it was an easy direct half-hour tube journey from where we were staying in Bastille. The route up to the Champs Elysées was equally straightforward. Actually, there was a slight hitch on the day as Line 8 had engineering works taking place at Charenton and the replacement bus was not running due to the Tour de France. No problem at all though. The engineering works were only taking place on a short section between Charenton and Maisons Alfort and there were RATP (Paris Transport) members of staff on hand to give directions for the 10-minute walk to pick up the Métro to reach Créteil. Even better, was the fact that this walk took us right through the Tour de France route. On our way to Maisons Alfort we saw the locals setting up picnics and laying out banners in anticipation of the arrival of the publicity caravan and the peloton. On we went to Créteil, where we arrived in time to see the publicity caravan leaving. The local council had laid on a mini outdoor cycling exhibition and activity area with freebies for spectators. Many people spent only a limited period of time in this area and instead, headed past the cordoned off VIP area to the car park where all the team buses were. It was pretty easy to see the different cycle racers and in fact spectators had just as much chance of seeing their cycling heroes as those with media passes. Whether you were in the private area or on the other side of the fence you had just as much of a scrum to see the stars if you had not made a special arrangement to meet the riders. There was also the dilemma as to which team bus to crowd around. It was hard to predict which racer would emerge from their team bus when, and the buses were arranged in such a way that it was a good 150m walk to get from the first bus to the last bus in the line. There was a distinct order in the way the buses were arranged and a definite hierarchy could be seen. Teams like HTC-Columbia High Road, Garmin-Cervelo, Sky, Cadel Evans' BMC team, Leopard-Trek of the Schlek brothers and Thomas Voeckler's Europcar team had barriers around them and some security staff in the vicinity. There was a long wait to see any of their riders come out of the bus, and whenever anyone emerged there was a big cheer followed by a surge of microphones and cameras from professionals and amateurs alike. The lower ranked teams like Vacansoleil and Movistar were way down at the rear of the line of buses and didn't even have barriers. There were no journalists around, and barely any fans pandering to see them. The racers got on with their business completely unhindered, practically unnoticed. Team RadioShack were also in this category. What a difference a year makes! It was easy to spend a couple of hours watching the pre-race activity. As this was the last day of the tour most of the riders were quite relaxed and there was a last day of school atmosphere. Riders were amenable and happy to greet fans, even if it was just to say a quick hello or pose for a photo. Also, there was a sense that the townsfolk of Créteil were thrilled to have Le Tour in their neighbourhood. Créteil is a suburb of Paris - not quite in the same league as Versailles, but more like Croydon, South London. Creteil forms part of "la banlieue", but thankfully not as bad as other eastern Parisian suburbs that endured riots in 2005 and there's no furniture store that got burnt down either. Having Le Tour would have been a real boost to the morale of the folks and this must have been very inspirational for the young people - even more so, as a plaque was unveiled there in memory of the late great Laurent Fignon. There was a very friendly atmosphere among spectators, and even when it got a little crowded when taking photos people were happy to take their photo and politely stand back to let others have a turn to take a few snaps. After the presentations of the various cycling stars on the stage, everyone ran across the large green to watch the riders set off. To accompany the 170 odd riders there were countless vehicles in tow - team cars for each of the 22 teams, cars for commissaires, first aid, neutral service, ambulances, media, VIPs, TV crew, motorbike outriders, motorbike photographers, time keepers on motorbikes and of course the team buses. There must have been around 80-100 vehicles plus a a couple of helicopters. Cycling is dubbed a carbon neutral sustainable form of transport, but when it comes to the Tour de France all that goes out of the window! To the cheers of all the crowds the riders set off on their final stage into Paris. We had only been at the departure town for a couple of hours but it already felt like we'd been there all day, with everything we had seen. I managed to see Jens Voigt, Cadel Evans, Philippe Gilbert, Thomas Voeckler, Frank Schlek, Alberto Contador, Mark Renshaw, Juan Antonio Flecha and George Hincapie. Ironically I didn't see any of the British riders. It was good to have seen a few high profile riders in the flesh anyway. Next stop was Maisons Alfort. We had to walk between there and Charenton during our tube journey back into Paris, so we stopped at the side of the road where by now the crowds had thickened, and we waited for the peloton to come by. We waited, and waited and waited. The race had started at 2.30pm and they were due to hit Maisons Alfort at 3.10pm according to the schedule sheet. But there was no sign of the riders at all. The peloton eventually came through at around 3.50pm, riding along slower than me on a bad day! They were chatting and in no mood to make any effort. I guess everyone has the right to an easy Sunday club run every now and again! The real action would begin when they reached Paris proper. It was great that the riders travelled along so slowly as this lent itself to taking half decent pictures - at least for Higg, that was. My photos still came out blurred! After this rather pleasant interlude during our return trip to Paris we picked up the Métro to Concorde station, where we literally arrived there as the riders were doing their first lap of Central Paris. 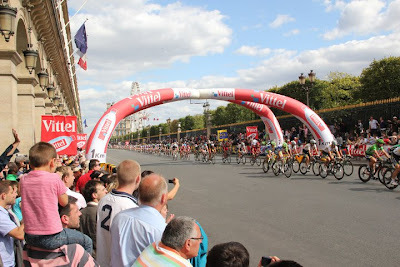 Concorde was so packed and there was no chance of us getting a decent view so we walked down the back road, rue St Honoré to get us out near Tuileries station, then found a great spot on the rue de Rivoli as the peloton blasted right past us. I was really enjoying the atmosphere in the July sunshine and it was really uplifting everytime the pack of riders steamed along at a phenomenal pace all to the cheers and claps of the crowds, as well as to the excitement of the commentators. Suddenly we realised we were cutting it fine to get our train back to London. 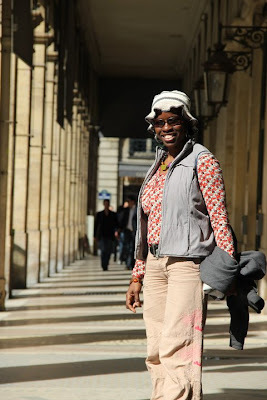 Sadly, we had to abruptly leave behind all this excitement to hotfoot it through Place Vendôme and pick up the Métro to Gare du Nord. So it wasn't until I reached London and turned on the TV that I was able to see Mark Cavendish clinch victory on the Champs Elysées! How ironic! Not seeing the heartstopping finish of the race was a bit of an anticlimax, but it had still been a really fun day out. 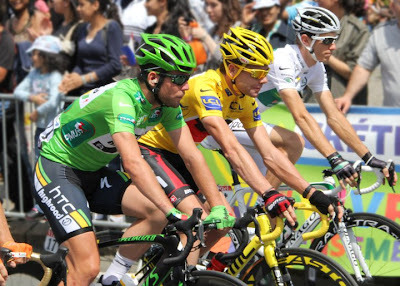 I would definitely recommend going to the departure town for the last stage of the Tour de France. Some departure towns are easier to reach than others. This year was an extremely good vintage in that regard and I am glad to have been there for almost all of the Tour de France proceedings of the day! The final stage of the 2012 Tour will start from Rambouillet, a western suburb of Paris. When I lived in France's capital city I remember Rambouillet being this deep in the forest, out in the styx place. Who needed to go all the way over there when we had Versailles?! I therefore don't really know the area, but what I do know is that it will be in a leafy suburb that has a big forest and a castle; I will need to catch a suburban train rather than the Métro; and I should book a late Eurostar when returning to London!